"This vegan enchiladas dish is one of our favorites and finds its way onto our dinner table every week. Try serving them with guacamole on top along with rice." Place a steamer insert into a saucepan and fill with water to just below the bottom of the steamer. Bring water to a boil. Add sweet potato, cover, and steam until tender, 2 to 6 minutes. Heat olive oil in a skillet over medium heat. Add onion; cook and stir until translucent, about 5 minutes. Add garlic; cook and stir until fragrant, 2 to 4 minutes. Add the steamed sweet potato, black beans, green bell pepper, spinach, lime juice, cumin, cayenne pepper, and salt. Cook until flavors blend, about 5 minutes. Add 2 cups enchilada sauce; cook until slightly absorbed, about 5 minutes more. Spoon 1 to 2 cups enchilada mixture into the bottom of a 9x13-inch baking dish and about 1 cup into each tortilla. Arrange filled tortillas in the baking dish. Pour remaining 1 cup enchilada sauce over the tortillas. Bake in the preheated oven until sauce is deep red and enchiladas are heated through, about 20 minutes. For fastest prep time, use canned enchilada sauce. 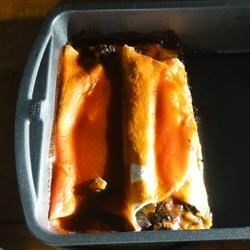 For best results, use the 10-Minute Enchilada Sauce recipe on Allrecipes. Use any kind of tortillas you prefer.